Is there any part of Disney that isn't magical - Princesses, Fairytales, Theme Parks, Exotic Vacations, I could go on and on. For each member of my family I am sure there are different answers to the question posed before us this week "For me and my family Disney Magic is..."
My first instinct was Sleeping Beauty, it is now and always will be my favorite Disney movie. I fell in love with Disney while watching this with my sisters in an old movie theater when I was about 4 years old. I also thought about how much Ashley & I enjoyed Disney's renaissance in the late 80's/early 90's with The Little Mermaid, The Lion King, and Beauty and The Beast. For Dakota it has to be the Pixar years with the Toy Story movies and Finding Nemo. As for Mike, well he just thinks we are all a little crazy...which may be a little true. Then it occurred to me, for ALL of us the true Magic of Disney can be found in the Magic Kingdom at Walt Disney World...Peter Pan's Flight!! It has to be the first attraction of the day in the Magic Kingdom, and we even try to end the day the same way. It's a great way to duck out of the rain or cool off on a hot summer day!! Peter Pan's flight is just one of my favorite rides. I just think the traditional "dark rides" evoke such memories about everything that makes Disney special. Bruce, I totally agree!! I love it just as it is, maybe it brings back childhood memories. 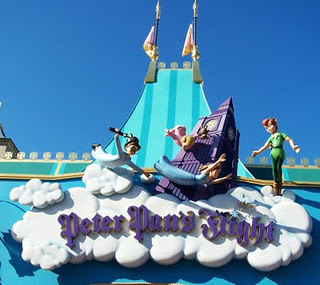 We haven't gotten to ride Peter Pan's flight on our last several trips, but we have it on our must-do list for this next visit! Heidi, It's our first ride in MK EVERY time. The one thing my hubby says we HAVE to do while we are there. My favorite attraction, too! It is SO magical. Except this past trip in which it seriously scared my 2 year old. I still made him ride it twice.. the whole time he said "scarreeddd" and then asked to go again when it was over.. silly kid! Jenn, I think I read that on your blog yesterday. I was heartbroken for him!! It will be better when he gets a little older. I always loved Peter Pan's Flight. I have some great memories of riding it with my sister. I can't wait to see what they do with the queue. Is there a chance you will get to ride again once they redo the queue Melissa? Kind of like they did with the Haunted Mansion? I hope so!! Sleeping Beauty is a favorite in our household too. My husband recently bought it for Tink and she asks for it all the time. And that's fine with me. I adore the artwork in that film. It's so different from the other Disney Classics, I love the artwork too. Such a beautiful movie! !